Axcient replaces your legacy backup, business continuity, disaster recovery and archiving products, with a single integrated cloud platform, making it simple to restore data, failover applications, and virtualize servers or an entire office with a click. Now is your chance to look behind the curtain and understand why Gartner ranked Axcient a leader in Recovery-as-a-Service. Recent trends in IT modernization have had a profound impact in IT budgets and on the role CIOs play. Join us to review current trends in IT, how the changing technology environment is reshaping backup and disaster recovery, and some of the key initiatives you should consider as part of your 2015 plans. Business continuity and disaster recovery are all about risks. Are you currently analyzing and using specific risk-based data for your BC/DR efforts? Midsized organizations have unique needs when it comes to a data protection strategy and system availability and so should be looking for new approaches to address its recovery and resiliency requirements. Let’s explore the solutions that are right-sized for midsized organizations, while delivering enterprise-level capabilities. Join analyst firm ESG and Axcient for Midsize Organizations Need a New Data Protection Strategy, an online session on the key trends shaping the data protection and recovery industry and why mid-sized organizations need to think differently if they are to continue in business. With virtualization becoming prevalent across organizations of all sizes, the question of how to better protect virtual servers and ensure business continuity is top of mind. This session will explore common alternatives for backup, replication, and cloud-based recovery for VMware, Hyper-V, and other virtualization technologies as well as key considerations when deciding on the best approach for your IT infrastructure. 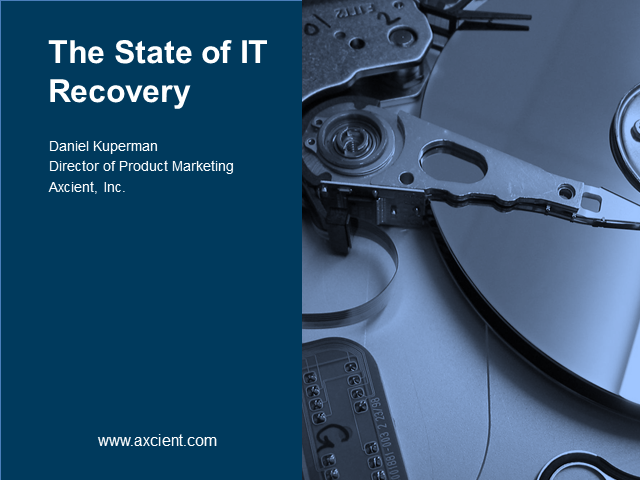 Senior ESG Research Analyst Jason Buffington talks about the broken state of backup and shares some insights into the challenges companies face protecting and recovering their data and IT operations and discusses how a hybrid solution like Axcient can help companies fight application downtime and improve their resiliency.